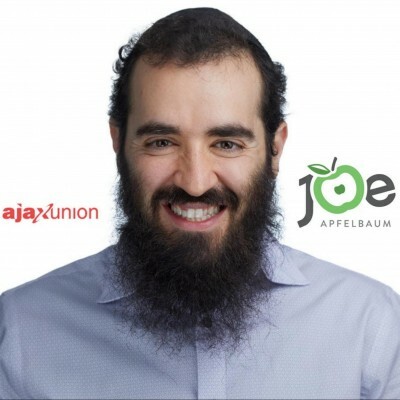 Joe Apfelbaum is the CEO of Ajax Union, a B2B digital marketing agency based in Brooklyn, NY. Joe is a business strategist, marketing expert and certified Google trainer. Joe is the Author of his new book High Energy Secrets, How he lost 95 pounds and has more energy than ever. When he is not Mojovating entrepreneurs at events and on social media he chills in Brooklyn with his Wife and 5 kids. Joe Apfelbaum, brings more than thirteen years to the online business, technology and marketing community. Serving as CEO and Co-Founder of Ajax Union, http://www.ajaxunion.com, he has been featured on Fox Business Network and Fox Business News and was selected by Google as a Certified Google Trainer. Using his humor and candor to address a wide range of topics that cover Online Marketing & Business Development including Search Engine Optimization; SEO, Pay-Per-Click; PPC, Social Media and Web Development, Joe has educated thousands to improve upon their business and online success. Ajax Union is a comprehensive internet marketing agency with a track record for client success and satisfaction. With offices in Brooklyn and Manhattan, Ajax Union serves business of all kinds and across many different industries, from mom ‘n pop retailers to major manufacturers. Really, we’re just a bunch of nerds who can help you grow your business online. Visit http://www.ajaxunion.com or http://www.joeapfelbaum.com for more information. This entry was posted in Uncategorized and tagged Ajax Union, authority, ceo, digital, expert, Google certified, Joe Apfelbaum, market, marketing, promotion, Today's Honoree, Web Development. Bookmark the permalink.